Growing up, I lived in a heavily Vietnamese area. Pho was my favorite thing. Then I moved out of the city and realized, to my dismay, that pho is not as accessible if you don’t live in a culture with a large Vietnamese population. I discovered sushi, which is much more mainstream (although based on Japanese dishes), and fell in love. I got my first apartment as a senior in college, but it was by no means my first time in the kitchen. I’ve been cooking the household meals for my dad and I since I was a junior or senior in high school, born out of a desire to stop eating just baked chicken with bread crumbs and roasted pork. I’ve been experimenting with various cultural dishes and unique combos since. Today I’ll focus on two recipes I often eat together: easy-to-make Philadelphia maki roll or crab meat maki roll sushi, and shrimp/chicken pho soup. These recipes are based on the Japanese and Vietnamese recipes found here (pho) and here (sushi). I’ve updated them according my taste and my abilities. You can make the rice itself using either a rice cooker or a normal pan with boiling water. I have done both. Use sushi rice that is specified for the making of sushi. This rice can be found at most supermarkets. I purchase mine at Stop and Shop in the cultural foods section. Make sure to wash the rice thoroughly. Rinse it with water until there is no longer a white residue to the water coming off of it. About 10 rinses or so usually does the trick. To rinse my rice, I usually place it in a small bowl or pan and pour water onto it, and then cover the rice as best as I can with my (clean) hands, allowing the water to drain from the rice. When you are cooking the rice, follow the package instructions. You may have to adjust them minimally for a rice cooker. When the rice is cooked and still warm, it is time to add the extra ingredients. Combine the other ingredients (rice vinegar, sugar and salt) in a pan over low heat. Stir the rice into this mixture, and continue stirring over low heat until it is mixed in. I will often touch the rice to feel the texture and make sure it sticks to my fingers. Now it is time to make this sushi rice into sushi. To begin, I lay out my nori, usually on a traditional rolling mat. I dip my hands into some rice vinegar to keep the rice from sticking to my hands. Then I gather a handful of rice and press it down on the ‘shiny’ side of the nori. (One side will be rougher and one will have a shine to it.) I spread it around the entire sheet. Then I flip the nori over. I prefer inside-out rolls, where the rice is on the outside. This is not necessary if you like the rolls with the seaweed on the outside. Now I cut up and add my chosen ingredients. Typically, I work with smoked salmon, crab sticks, cream cheese and avocado. Americanized Philly rolls usually have cucumber too, but I am neutral about this ingredient so I leave it out. Sometimes I substitute crab sticks and have double the amount of fish instead. Prepare the rice noodles as the package says and set them aside. I have found that sometimes boiling the water for these noodles isn’t necessary if your sink produces hot enough water. I usually set the noodles aside in a very hot bowl of water from the sink, and they loosen up just fine. In a large pot, warm the sesame oil over medium heat for 60 seconds. It will begin to shimmer when it is ready. Add the chopped ginger and chilli garlic paste and stir. Stir in the chicken broth, soy sauce, hoisin and cinnamon. Bring this mixture to a boil, and then add peeled shrimp or cooked and cut chicken. I often use pre-packaged cooked chicken strips for this reason, so I can avoid the extra step of preparing the chicken. Or I will purchase shrimp that is cooked from the fish department at a supermarket. Sometimes I make this recipe with chicken, sometimes with shrimp – and often with both! 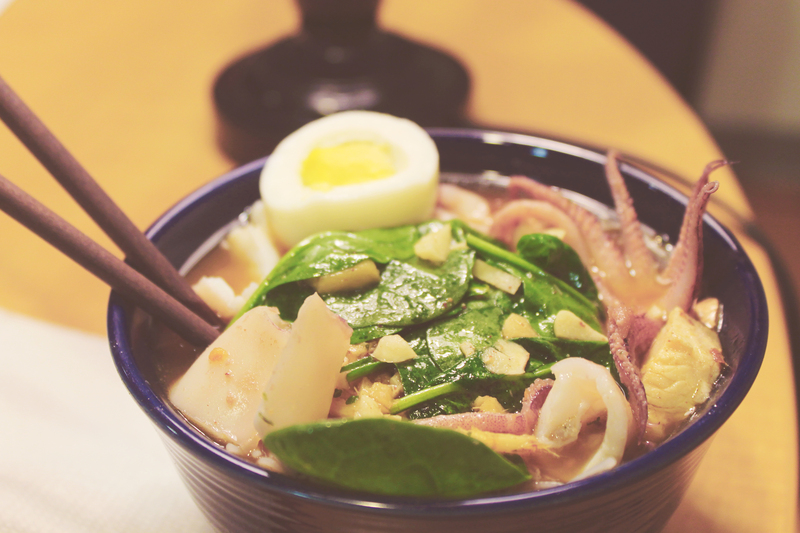 Divide the rice noodles between your two-three bowls and ladle the soup into each bowl. Sometimes you can add extra garnishes as well. One week, my girlfriend and I bought squid and cooked it before adding it to the pho. It tasted delicious! Another week, she boiled an egg and cut it in half, and we shared it between our bowls. We also sometimes add spinach, which has many health benefits (and which we prefer to bok choy, the more traditional Vietnamese recipe). Often, there will be leftover broth. You can choose to use less rice noodles per serving, or you can eat the broth as-is. Personally, I find it delicious on its own! 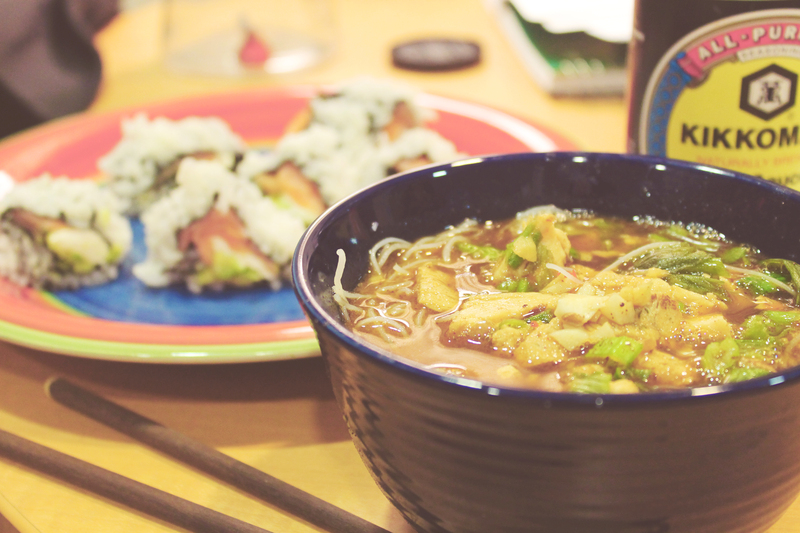 We will usually serve the pho and sushi for dinner as a combination: one bowl of soup and one 8-piece maki roll. I find that this is a very filling dinner with a lot of different flavors. I use chopsticks to eat my maki and pho, but you can also use forks (or your hands, for the sushi).